Bitforest Co., Ltd. today released two new premium plans—Standard and Professional—for its continuous web security testing service, VAddy (http://vaddy.net). The premium plans add team functionality and allow users to scan for three additional types of vulnerabilities: remote file inclusion, command injection, and directory traversal. These new features make it possible for software development teams to automatically run security scans on large-scale web applications. VAddy is a cloud-based service that connects with continuous integration (CI) tools to implement continuous security tests for web applications from the start of their development cycles. Since the release of VAddy’s Japanese beta in October 2014 and its English beta in April 2015, the service has already been used by hundreds of developers both in Japan and abroad. The Free plan is intended for new or light users of the VAddy service. It offers all the same features as the previous beta version, but it limits scan times to 5 minutes. The Standard plan is intended for ordinary development teams and web applications. 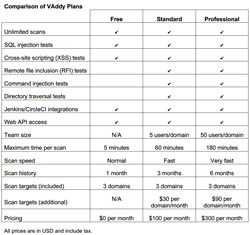 In addition to offering all the same features as the Free plan, the Standard plan allows users to scan for a wider range of vulnerabilities, run scans for up to 1 hour, view scan results for up to 3 months, collaborate with teams of up to 5 members per domain, and even register additional domain names to scan (for $30 per domain/month). The Professional plan is intended for large development teams and web applications. In addition to offering all the same features as the Standard plan, the Professional plan allows users to run scans for up to 3 hours at the fastest speeds, view scan results for up to 6 months, and collaborate with teams of up to 50 members per domain. Bitforest Co., Ltd. is a purveyor of web application security technologies that has been designing, developing, running, and consulting on web sites and systems since February 2002. The company is currently led by Tokiichi Takao, its president and CEO. More information on the company can be found at its English website, http://vaddy.net/company.html, or its Japanese website, http://www.bitforest.jp.